Illinoisans are hospitable people who always put other’s need before their own. Want to help people and make a positive impact on their lives? Become a licensed hearing aid specialist to help people of all age group hear clearly. It is easy to pass the hearing aid specialist licensing exam here in Illinois as Hearing Aid Academy helps you prepare for the exam in less than 12 weeks. Thinking how’s that even possible? Well, Hearing Aid Academy provides a 100 hours training program divided into 31 modules which can be completed at your speed. The course caters to the important education material while cutting back on unnecessary subjects. Moreover, we have qualified instructors on board with more than 30 years of experience to help students clear their doubts and prepare for the program. Ronald Reagan was the 40th president of the United States, and a former Hollywood actor who made history in the hearing aid industry. While hearing loss has affected many American presidents, Ronal Reagan was the first president to publicly announce the use of hearing aid while in office. The hearing aids helped with his difficulty in hearing high-pitched sounds. It was reported that the president began to lose his hearing power way back in the 1930s when he was still a Hollywood actor. However, it was only later in the 1980s that he decided to use a hearing aid owing to advancement in technology and small size. His public acknowledgment of the hearing aids encouraged the hard-of-hearing community to come forward and use the hearing aids. President Reagan was responsible to remove the negative stigma around the hearing aids and give a positive public recognition to the hearing health industry. It is vital to find hearing aids that are right for you and fit your lifestyle. This is why many companies are opening up hearing centers in their locations nationwide. To grab the opportunity and increasing your earning potential, enroll with the Hearing Aid Academy. This 100% online curriculum prepares you for the hearing aid specialist licensing exam administered by the International Hearing Society (IHS), here in Illinois. Then a career as a hearing aid specialist here in Illinois suits your requirements. Do you know, according to the labor statistics, the average salary of a hearing aid specialist is over $58,000 per year? However, due to increasing demand for licensed specialists, some companies are paying significantly more than the average salary. What’s more? To clear the hearing aid specialist licensing exam here in Illinois, you are not required to spend thousands of dollars and two years of your life. You can prepare for the exam for a fraction of the amount in less than 12 weeks. Moreover, you are not required to leave your daytime job or say no to your personal commitments. You can study while working your full-time job. The hearing health industry is high in demand and offers long-term stability. This is a fast-growing industry and many retail locations such as CVS Pharmacies, Costco, Sam’s Club, and Walgreens are opening hearing centers around the nation. However, these companies are unable to find enough licensed hearing aid specialists to fill the jobs they are creating. Do you know, for every individual passing the hearing aid specialist licensing exam, there are five job openings? So why not take advantage of the growing industry and become a licensed HAS? The hearing aid job market is not slowing down anytime soon. With an aging population and different lifestyle factors contributing to the increasing need for hearing aid, you have a perfect career opportunity lying in front of you. Working as a hearing aid specialist provides you a prospect to make a real difference in people’s lives. Apart from working for an employer, you can open your hearing aid center and work for yourself. Many hearing aid retail center owners who have built multiple locations in a region can earn more than $750,000 per year. As a licensed hearing aid specialist, there is endless earning potential in the market. What Does a Hearing Aid Specialist’s Job Involve? 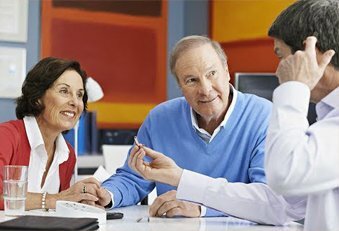 Working as a hearing aid specialist at a retail location involves evaluating people with hearing loss and helping them choose the best hearing aid. The HAS is also responsible for providing a series of tests and evaluations to ensure the hearing aid fit properly and perform perfectly. A hearing aid specialist can work at a retail location, offer mobile hearing aid testing or own a hearing aid center. You can easily generate up to $1000 profit on the sale of a set of hearing aids. So, a couple of hearing aids sales can add up to nearly $100,000 profit per year to your annual income. To get licensed as a hearing aid specialist, you must pass the written and practical hearing aid specialist licensing exam here in Illinois. The International Licensing Examination (ILE), administered by the International Hearing Society (IHS) is conducted through each state in the United States. The Hearing Aid Academy prepares you for the exam while helping you save time, money and efforts. This specialized online training can get you licensed in about 12 weeks. So fast track your education and complete the training in less than 3 months. Start your career with an impressive earning potential. Enroll with the Illinois hearing aid specialist licensing program today. Call the Hearing Aid Academy at (903) 487-0097 or email at admissions@hearingaidacademy.com.